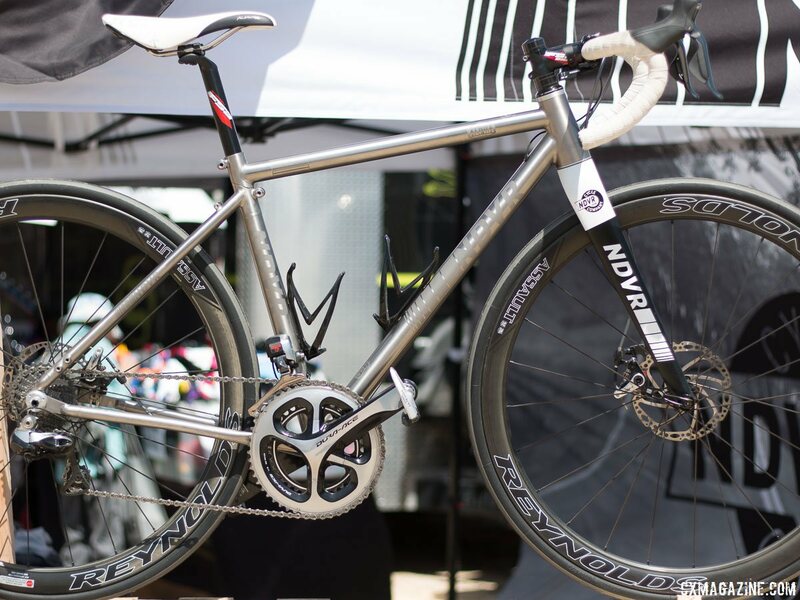 Ndvr, a new company based in Athens, Georgia, showed off a bike at the 2016 Sea Otter Classic that really caught our eye. 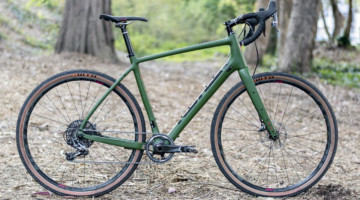 The Ndvr is trying to be the ultimate versatile bike, part cyclocross, part gravel, part road and all travel featuring the company’s “all roads, ready to ride” geometry. The Ndvr is made in US by Lynskey. 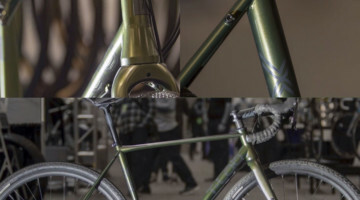 From fully ready to ride to in its own travel bag is said to take 5 to 10 minutes according to Ndvr staffers and the mechanics of taking the bike apart to suitcase it is a modified version of the Ritchey Breakaway system. 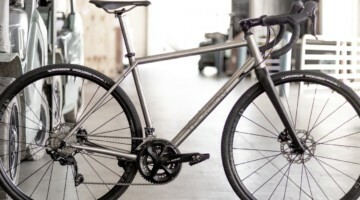 The 3/2.5 titanium frame, aside from the ability to be taken apart, has a lifetime warranty and features clearance for 42mm tires thanks in part to 43.3cm long chainstays, rack and fender mounts, a 142x12mm rear thru axle and a BSA bottom bracket. 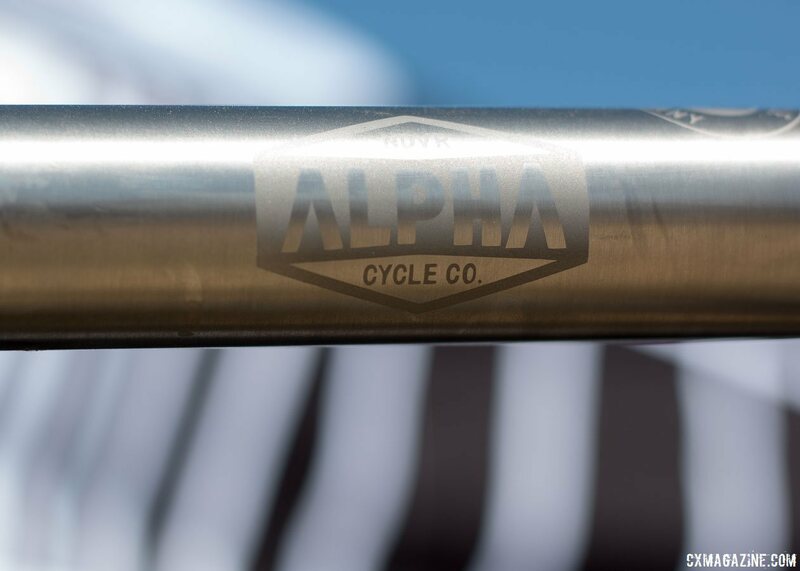 The frame uses straight gauge, round tubes. The full carbon, tapered fork features a 15mm thru axle. The frame also features Di2 cable ports, and the stock builds are either Ultegra Di2 or Dura Ace Di2. Interestingly, the Ndvr utilizes mechanical discs brakes. When asked about this specification, Ndvr staffers mentioned that it’s a means to avoid issues with hydraulic lines developing air in them in flight, an issue we’ve heard others have experienced. The frame, fork and travel bag retail for $3,500 USD and the Ultegra Di2 6870 model comes with the travel bag. The company is currently running a Kickstarter and there the Dura Ace Di2 9070 sells for $8,000 USD. There are also Shimano XTR Di2 9050 1x and SRAM eTap builds available.